The zooms on bridge cameras just keep getting longer and longer. 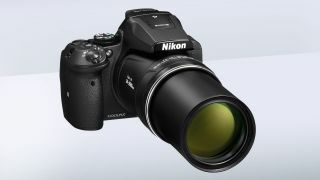 Nikon's previous model, the P610, had a 60x zoom, but the P900 beats this with ease. With Nikon's Dynamic Fine Zoom system, the zoom range is doubled, offering a 166x zoom and 4000mm equivalent focal length – though this will inevitably have an impact on the image quality. The longer the zoom, of course, the worse the wobble, but Nikon has tackled this with a Dual Detect Optical VR system that offers a 5-stop shutter speed advantage. The P900 also has a side zoom control you can operate with your left hand while gripping the camera with the right, in order to cut down any shake still further. Round the back is a 3-inch vari-angle display and an electronic viewfinder with eye sensor. The Dual Detect system is based around an angular velocity sensor in the lens along with 'motion vector information' from the sensor. Inside the P900 is a 1/2.3-inch 16-megapixel back-illuminated CMOS sensor – the same as the one in the P610. It has a 3-inch, 921k dot vari-angle LCD and a electronic viewfinder with eye sensor, and you get GPS, Wi-Fi and NFC thrown in too. The monster zoom means the P900 weighs nearly 900g (2lb). The super-long lens has had an impact on the dimensions, though. The old P610 weighs 565g (1lb 4oz), but the new P900 is larger and weighs a massive 899g (1lb 15.8oz) – that's as much as the average DSLR and kit lens combination. The P900 goes on sale at £500/US$600 (about AU$770) on March 19th 2015.